The purpose was to study oral contraceptive (OC) use in relation to breast cancer events and endocrine treatment response in a prospective population-based cohort, because it is unclear whether history of OC use impacts on prognosis in breast cancer patients. Between 2002 and 2011, 994 primary breast cancer patients without preoperative treatment were enrolled in Lund, Sweden and followed until December 2012. History of OC use was obtained from preoperative questionnaires. Tumor characteristics, clinical data, and date of death were obtained from pathology reports, patient charts, and population registries. Among the 948 patients with invasive cancer and no metastasis detected on the post-operative screen, 74 % had ever used OCs. Patients were followed for up to nine years (median follow-up 3 years), and 100 breast cancer events were recorded. Ever OC use was not associated with prognosis, irrespective of duration. However, any OC use before age 20 was associated with a threefold increased risk for breast cancer events in patients <50 years but not in patients ≥50 years (P interaction = 0.009). 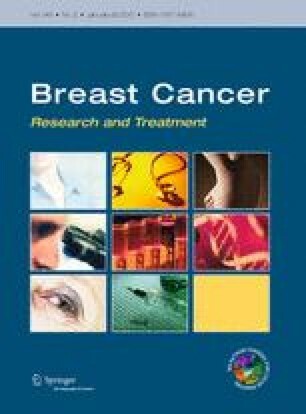 In patients ≥50 years with estrogen receptor positive tumors, previous OC use at any age was associated with a significantly decreased risk of breast cancer events among patients who received aromatase inhibitors compared to patients who never used OCs (adjusted HR 0.37: 95 % CI 0.15–0.87). OC use was not associated with tamoxifen-response. If confirmed, history of OC use may yield valuable prognostic and treatment predictive information in addition to currently used criteria. Louise Huzell and Mia Persson have shared first authorship. This work was supported by grants from The Medical Research Council, The Swedish Cancer Society, The Medical Faculty at Lund University, The Mrs Berta Kamprad’s Foundation, The Gunnar Nilsson Foundation, The King Gustaf Vs Jubileumsfond, The South Swedish Health Care Region (ALF), The Swedish Breast Cancer Group (BRO), and the Skåne University Hospital, Lund Fund. The authors thank our research nurses Linda Ågren, Maj-Britt Hedenblad, Karin Henriksson, Anette Möller, Monika Meszaros, Anette Ahlin Gullers, Anita Schmidt Casslén, Helén Thell, and Jessica Åkesson. We thank Dr Eric Dryver for proofreading.